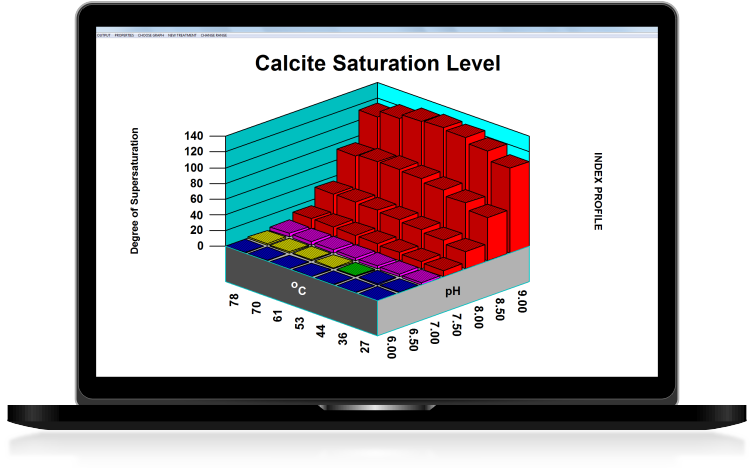 DownHole SAT - Oilfield Chemistry Modeling Software | French Creek Software, Inc. Engineer and lab ready modeling to simulate single oilfield brines, wells, and mixtures. DownHole SAT utilizes an engineer's approach to modeling oilfield brines using rigorous physical chemistry, with on-the-fly usability. Export beautiful, customer or presentation ready reports and color-coded 3D visual aids. Model scale potential over even the broadest operating ranges for 18+ scale forming species. Model a single brine, an injection well scenario or a mixture of up to 12 brines. DownHole SAT Premium Editions include a CO2-H2S Corrosion Module. Plot in table or 3D graph format. Generate your own model with a Lab Edition. Premium Editions enable users to input their own custom formulations. French Creek provides models for most commonly used inhibitors. Custom materials and molecules can be entered with Laboratory Editions. Running a large number of analysis each day? For an additional fee, supercharge your DownHole SAT license with batch processing support, straight from your LIMS. Setup is easy and can drastically reduce/eliminate manual input. After rigorous speciation and ion pairing, French Creek programs simultaneously model 18+ relevant scales. Saturation levels are displayed over an adjustable range of typical to stressed operating conditions. Model versus temperature, pressure, pH, and mixture ratios. View scale potential over narrow to broad ranges. 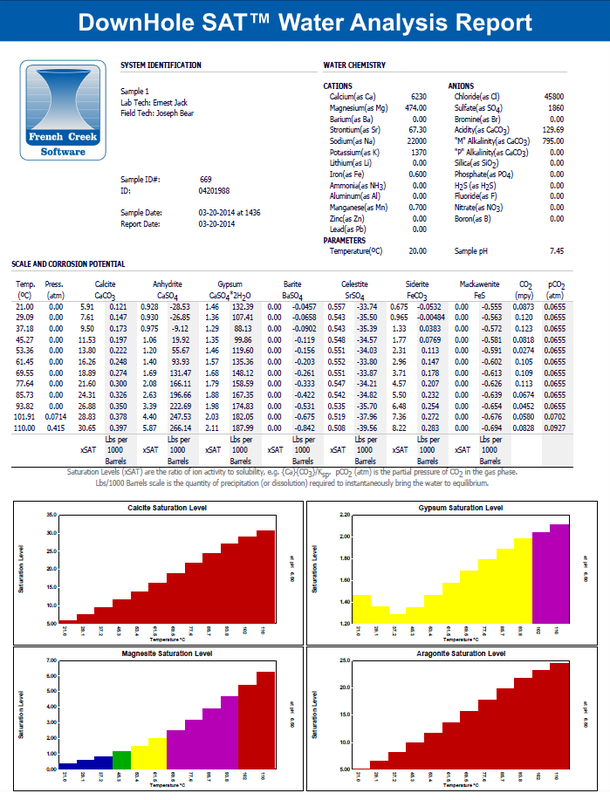 3D color coded graphs for any scale, corrosion, or inhibitor dosage profile. Custom formulations, using common materials, can be quickly entered and distributed to staff or other personnel. These models contain data for dosage suggestions and product limitations. Lab editions can be used to generate models from lab and performance data. Compare DownHole SAT editions. Several models come standard with French Creek applications -- like the CO2-H2S module in DownHole SAT™. View data in table from, 2D graph form, or 3D graph (below). Need a tool for selecting metallurgy? The DownHole SAT™ Laboratory Edition helps you develop your own field specific corrosion model from your own historic brine chemistry and corrosion rate data, (including optional inhibitor dosages). Supercharge your DownHole SAT with batch processing. Any edition (from Basic to Laboratory) can be made an Analytical Version for an additional fee. The Analytical Version Module is capable of batch processing hundreds of analysis simultaneously via LIMS CSV output, eliminating manual reentry.